The seminal work by Brown et al. (2009) showed that heat treating silcrete (a silica rich rock type) was a practice of Middle Stone Age (MSA) humans in southern Africa. This was done to enhance the flakeability of naturally occurring silcretes, which in their un-heated forms are less workable (Mourre et al., 2010). The Brown et al. experiments added another cognitive / technological marker to the accumulating list of characteristics (including mastic production, projectile weapons technologies, site maintenance behaviors and the production of symbolic objects) showing that MSA humans had well developed executive functions of the brain (Wynn and Coolidge, 2011). Such studies have allowed archaeologists to develop more nuanced models to explain the evolution of human behavior during the MSA. Fig. 1. Comparison of un heat-treated silcrete (left) to heat-treated silcrete (right) emphasizing the change in texture and grain quality between the two. From Pargeter 2013. The Brown et al. (2009) experimental model for silcrete heat treatment suggested that silcrete nodules were first buried under sand and a fire for heat-treating was then placed on top of this protective sand barrier. This ‘high investment’ model would have required considerable investments in wood for fires and in time for heat treatment. In 2013 Schmidt et al. (2013) published a series of laboratory silcrete heat treatment experiments showing that silcrete can be effectively heat treated in less time and with less energetic investment. This ‘low investment’ model had, according to the authors, profound impacts for the way fire was used as a measure of MSA hominid cognitive and behavioral abilities. The Schmidt model suggested that heat-treating silcrete was no more laborious and would require no more cognitive investment than producing mastics for tool hafting (in and of itself a massive achievement during the MSA). An important outcome of the Schmidt et al. experiments was the observation that silcrete could be effectively heated using not much more than the heat and embers from an open camp fire. Data to be published this month in the Journal of Human Evolution by Lyn Wadley and Linda Prinsloo (Wadley and Prinsloo, 2014) challenges the Schmidt, ‘low investment’ model using a series of actualistic, field-based heat treating experiments. Their experiments heated silcrete from the Pinnacle Point region, therefore the same as that in the Brown et al. (2009) experiments, in open-fire, coal and sub-surface conditions. A high number of their experimental cases involving surface heat treatment showed the material often cracked and fractured. These results are contrasted with their sub-surface heat treatment in which no samples showed signs of fracturing. Wadley and Prinsloo conclude that MSA hominids controlled fire and the heat treatment of silcrete in a precise, patient and systematic manner in direct contrast to the heat treatment model proposed by Schmidt et al (2013). These two experimental results therefore provide fuel for fundamentally different interpretations of the behavioral patterns underlying heat-treatment technologies. Silcrete blocks after heating. A. Undamaged blocks heated underground (Fire1). B. and C. Blocks that fractured during above ground heating in Fire 1 and Coal Bed 1. From Wadley & Prinsloo 2014. Collectively these studies highlight the crucial role of not only experimental interpretation, but also experimental design in archaeological research. Brown et al (2009) and Wadley & Prinsloo both employ field-based experimental approaches advocating a more naturalistic approach to replicating heat treatment. Schmidt et al (2013) on the other hand employ a laboratory furnace to heat their samples. Each of these conditions will likely have significant effects on the experimental outcomes with far more variables at play in the field-based approaches, but less realistic heating scenarios in the laboratory furnace set up. The utilization of two fundamentally different, yet equally acceptable, approaches to conducting experiments in archaeology highlights the uniqueness of the scientific method in this discipline, which clearly is not without its own problems. The coming months will be worth looking to for updates as the research on this issue moves beyond this current experimental impasse. Brown, K.S., Marean, C.W., Herries, A.I.R., Jacobs, Z., Tribolo, C., Braun, D., Roberts, D.L., Meyer, M.C., Bernatchez, J., 2009. Fire As an Engineering Tool of Early Modern Humans. Science 325, 859-862. Mourre, V., Villa, P., Henshilwood, C.S., 2010. 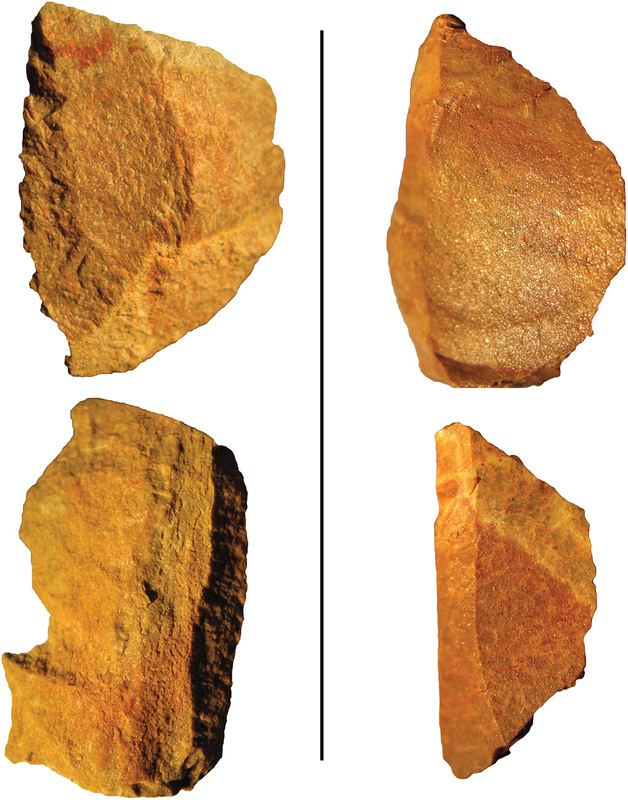 Early use of pressure flaking on lithic artifacts at Blombos Cave, South Africa. Science 330, 659-662. Pargeter, J., 2013. Rock type variability and impact fracture formation: working towards a more robust macrofracture method. Journal of Archaeological Science 40, 4056-4065. Schmidt, P., Porraz, G., Slodczyk, A., Bellot-Gurlet, L., Archer, W., Miller, C.E., 2013. Heat treatment in the South African Middle Stone Age: temperature induced transformations of silcrete and their technological implications. Journal of Archaeological Science 40, 3519-3531. Wadley, L., Prinsloo, L.C., 2014. Experimental heat treatment of silcrete implies analogical reasoning in the Middle Stone Age. Journal of Human Evolution, To be announced. Wynn, T., Coolidge, F.L., 2011. The implications of the working memory model for the evolution of modern cognition. International journal of evolutionary biology 2011, 731357.